Stylus sensitive 6″, 8″ or 9.7″ 16 shades of gray touchscreen so you can scribble your notes right on top of the text. Native support for many data formats including PDF, HTML, TXT, CHM, ePub, PDB, MOBI, PRC, JPG, BMP, PNG, GIF, TIFF, MP3, WAV. Integrated WiFi. Optional EVDO or 3G wireless module. Either by accelerometer similar to the one in iPhone or by explicit user input it’s possible to use it both landscape and portrait modes. Cool feature but in my opinion it’s not too relevant to book reading. It is claimed that it has handwriting recognition. This makes me assume that touchscreen wouldn’t respond to fingers because that requires magnetic sensors similar to ones found in Tablet PCs that capture stylus movements precisely including tilt angle. This allows recognition to be much more accurate at the cost of these sensors ignoring anything but the stylus. Web Browser that is based on WebKit (same library that powers Apple Safari and Google Chrome). This would probably yield browsing experience that is superior to Kindle. There is on-screen keyboard available. I wouldn’t mind having something like that on Kindle with extra space allocated for bigger screen that can be used for reading when keyboard isn’t required. It will be possible to install additional applications but it’s unclear whether SDK will be released. Text-to-speech capability. Though because of the noise in the video it was impossible to tell how good is it. Below is the official promotional video. While it has many cool features like larger screen, touchscreen, large selection of formats that it supports, few of these features are actually useful in day-to-day operations. Overall it looks more like e-Ink PDA rather than eBook reader. WebKit based browser is nice but slow e-Ink screen will negate most of the benefits. iPhone with 3.5″ display would provide much better overall web-browsing experience. Running additional application can’t be good for battery life. And while touch screen is cool, how often would you really need to scribble and use handwriting recognition? Most of these tasks can be much better performed by other devices like PDAs, iPhone, etc. But most importantly, what about books? Without having access to Amazon’s Kindle Store with 240,000+ titles it would be limited to much smaller selections of the stores that would decide to partner with Onyx and free books. Which is not a whole lot compared to what Amazon has to offer. Most likely book buying experience will not be as easy and streamlined as one with Kindle. There’s one great feature that really made Onyx Boox stand out – larger screens. Although I’m pretty sure that “cheaper than $400″ price tag that was announced on CeBIT applies to 6” model and ones with larger screens will cost more. Nonetheless there would be people for whom larger screen would outweigh all cons and they would buy Onyx Boox rather than Amazon Kindle should it have access to the same selection of books. And this is why I believe Amazon would not partner with Onyx to protect it’s Kindle sales. Poor state of US and worldwide economy wouldn’t help sales either. So although this post is under “Kindle Killer” category, really it’s Kindle Killer… Not. I know that this post may sound too Kindle biased, but that’s my opinion. Anyway, we’ll be able to find out if I was right soon enough. I’ll keep you posted. 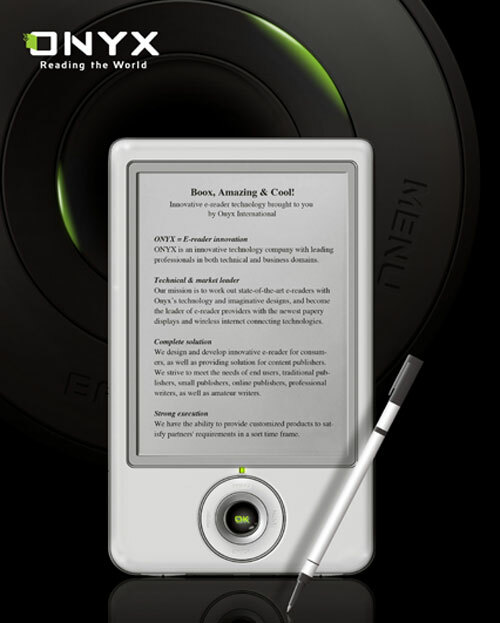 This entry was posted in E-Book Readers, eInk Technology, Kindle Competition, Kindle Killer, Kindle Thoughts, Video and tagged cebit, endgadget, onyx boox, touchscreen by Dzmitry. Bookmark the permalink. It’s true, you show some bias here, but then the Kindle is one heck of a device and deserves some praise. Amazon book store – Never used it and never plan to. In some cases I was able to buy the ebook directly from the publisher and I prefer that my money more directly support what really made the book possible. To me more click-n-go options for purchasing is better, I dont want to be limited. My collection – Several thousand strong and growing. A big jumble of formats which depend on which device I owned when I got the book. The Boox has a pretty good compatibility list and my current conversion tools will take care of the rest. My location – I don’t live in the US so Amazon doesn’t want to sell me a Kindle and were I to get one I wouldn’t be able to use my favorite selling point, Whispernet. While the Boox may only have Wifi that’s good enough for the limited browsing I want to be able to do. I don’t really need to make a snap purchase when I’m carrying 4 gigs worth on an SD card (although I hope it will do SDHC). I don’t think the Boox needs to be a Kindle killer because for lots of us the Kindle isn’t even an option. Thanks for the interesting news and very good review. In 2009 new eReaders models appear on the market like mushrooms after the rain. 1] 99.999% of stuff can be touchscreen then when ya wanna jot down notes or sketch or whatever, the stylus is available. 2] The navdisc is nice & simple — select/click bingbangboom. 4] .PDF support right out of the box. I am surprised that you don’t think is will be successful. In none-English countries or for people reading their own materials, the lack of access to Amazon books wouldn’t be a problem at all. See how many languages this device supports and you’ll know where is truly aims at. That would have been fine if Onyx would be preparing for an international release. But all indicates that they are actually trying to market this thing in the US. Therefore I stand by my original statement.